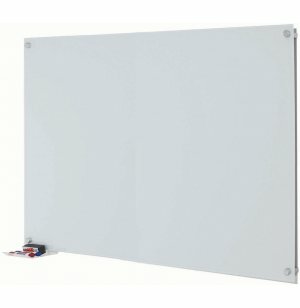 Looking for a more classy alternative to the run of the mill whiteboard? Glass dry-erase boards are sleek enough for a high-class professional setting. Let Aarco Glass Dry-Erase Boards welcome you to the office or classroom of the future. Once you have experienced their elegant aesthetic and decidedly modern minimalism, you will never want to go back to regular old whiteboards. Pure glass whiteboards help create a functional room design with the unique appeal of contemporary glass. These high-performance boards are made of durable, 1/4" clear tempered glass with a white background, that will not ghost or stain. This high gloss, non-porous material provides a silky smooth writing surface that cleans easily. A built-in floating marker tray enhances the design of these dry-erase boards, providing the perfect place for erasers and writing implements. Modern Aesthetic: Sleek ¼" tempered glass is appropriate for a contemporary office or classroom. 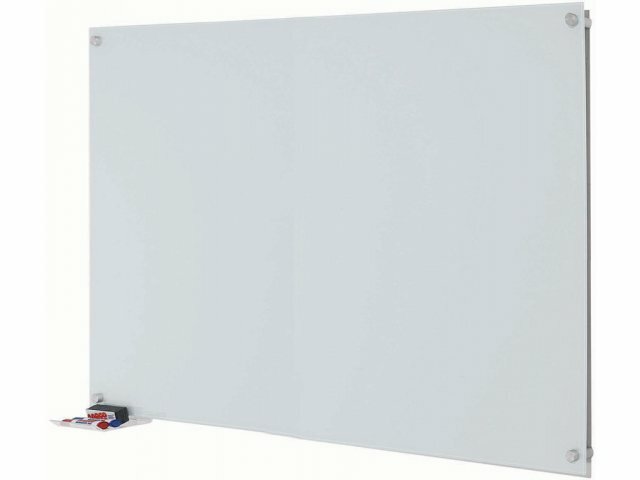 Non Stain: Unlike regular whiteboards, tempered glass boards fully erase leaving no stains or ghost marks. Convenient Design: Clear, durable acrylic marker tray keeps markers and erasers handy. Elegant Details: Clear glass surface with a silk-screened white background is complemented by classic satin-finished mounting stand-offs which keep boards firmly in place. Complete Package: Includes eraser and four dry-erase markers.